The course aims to provide systematic fitting technology training, through lectures and practical workshops. The course aims to provide systematic fitting technology training, through lectures and practical workshops. 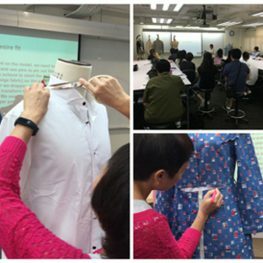 Participants will learn the essential knowledge of garment fitting technology which includes garment fit concept, fabric selection, pattern construction, cutting, 3D CAD for fitting and garment sewing as well as apply the skill set on evaluating and solving common fitting problems. Certification: To obtain a certificate, student must have attended no less than 70% of the training hours of the course. Limited to 20 students on a first-come-first-served basis. However, the Authority reserves the right to reject applications, and in which case, the tuition fee will be refunded in full.